Use the same shutter glasses that many theatres use for 3D projection! Uses DLP-Link technology (def) Durable and light! To further eliminate potential crosstalk, XpanD X102 Series is designed for DLP®-Link communication between the glasses and TV/projector. Please check the list below to see if your glasses are compatible. 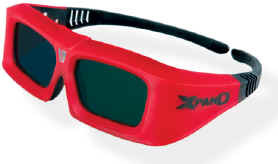 XpanD X102 Series active glasses are rugged and flexible. The glasses were designed with flex points, which extend the lifetime of the glasses. To better manage battery life, the X102 Series glasses turn "OFF" automatically. 3D requires as much light as possible. XpanD X102 Series features the fastest shutter technology for the brightest image. Extended White-Light Range supports large rooms. The exact range depends on the amount of light coming from the projector or television. The Range is 80 feet. XpanD X102 Series components are built to work in extreme conditions, further endorsing XpanD’s long standing achievement of having the highest 3D reliability. XpanD X102 Series is optimized to work with DLP® chips. XpanD X102 Series works without any installation. The user simply turns on the glasses when they wish to view 3D content. What type of display can I use with XpanD X102? 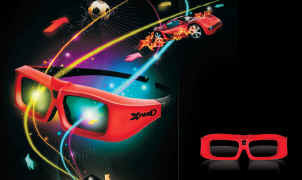 Any DLP® Link 3D ready projector or television. See below for compatible TVs or Projectors.